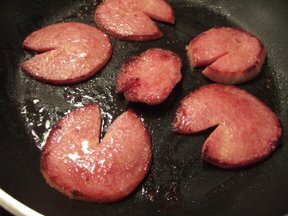 Ok…it just didn’t feel kosher for me to write this post on Taylor Ham (pork roll…a beloved New Jersey delicacy) yesterday. Yes, I am a “Jewbie” (my self-appointed moniker as a recent convert to “The Tribe”), and I have been known to enjoy bacon now and then. (Why is it that bacon makes everything taste better??? Hmm…some habits die hard). And I think it would have been a major no-no to write a post about a pork product (read: NON KOSHER) on the Jewish Sabbath. But, I would be remiss and irresponsible blogger if I did not share with you the NJ culinary treasure that is indeed Taylor Ham Pork Roll.